Weight Per Cubic Inch, lbs. All bearings have a P/V rating (Pressure/Velocity) based on empirical testing. The rating is a mathematical expression of Pressure (PIA = pounds per inch of projected area) times Velocity (SFM = surface feet per minute). The expressed P/V value of a material is the maximum load-speed that a bearing can withstand. This value is further refined by the maximum PIA and SFM that the material can withstand regardless of the total P/V value. The recommended P/V factor for Woodex® is 12,000, with a maximum PIA and SFM of 2,000 each. Woodex is unusual in that it has the capability to handle both high speeds and loads, a quality that enhances its flexibility. As an example, in a dry, ambient condition a 2" long Woodex bearing supporting a 1" shaft can support a shaft load of up to 1,800 pounds, while the shaft is rotating at 50 rpm. Conversely, the bearing can tolerate a shaft RPM of up to 1,800, while the shaft load is 50 pounds. PIA and SFM must each equal 2,000 or less. Multiply PIA times SFM: the product (P/V) must be 12,000 or less. If true for all three values, Woodex may be right for your application. NOTE: Add appropriate safety factors to both load and speed before calculating. It is important that the wall thickness of the bearing meet minimum standards. Proper wall thickness will guarantee a sufficient supply of lubricant to last the life of the bearing. Shaft size can rarely be reduced, but housing size may be increased to satisfy this requirement. * Thinner bearing wall may produce reasonable service life under certain conditions. An oil-lubricated bearing must have sufficient clearance to allow the lubricant to penetrate and form a lubricating film. Insufficient clearance will inhibit this lubricating film and excessive clearance will allow excessive movement between parts. Either condition will result in premature bearing failure. The inside diameters of all Woodex bearings are machined oversize to provide the required clearance. Designs that require tighter tolerances can be met by supplying bearings without built-in clearance and calling for reaming at installation. Reaming will not restrict the self-metering lubrication qualities of the bearing. A Woodex bearing remains stationary in its housing because it has been furnished with an oversized outside diameter to ensure firm retention. Sleeve, flange and roll-end bearings are all machined to include this press fit. 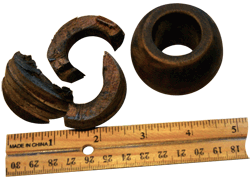 Oil impregnated maple bearings have greater press fit dimensions than metal, since they are much more compressible. The compressibility of oil-impregnated rock maple means that approximately 70% of the press fit on a Woodex bearing will be reflected in close-in of the inside diameter. Woodex bearings are normally furnished with an oversized inside diameter. This provides a correct running clearance once the bearing has been pressed in place and the close-in effected. In a lubricated bearing, the oil must be delivered to the load carrying area of the interface. In order to do this, a wood bearing must have its bore at right angles to the grain of the wood. Aligned in this cross-grain fashion, the cell structure meters the lubricant to the interface. These modes indicate the effectiveness of bearing lubrication in reducing friction. Boundary lubrication permits bearing-shaft contact in the presence of an extremely thin lubricating film. Bearing wear is proportional to load and speed. Under full-film lubrication, the shaft is completely separated from contact with the bearing by a thick film of lubricant. Without shaft to bearing contact, bearing service life is nearly infinite. This condition is rarely - if ever - achieved with a wood plane bearing. Mixed film lubrication combines both other modes. Pools of self-pressurized lubricant accept part of the load while very thin films take the rest. While Woodex bearings normally carry a lifetime lubricant supply, some applications where the bearing is immersed in oleophilic process material (sawdust, wood fiber, fine, dry flour, farm soil) will require additional lubrication. 30-weight non-detergent motor oil is ideal in most cases; for farm machinery such as disc harrows and cultipackers, a general-purpose grease should be used. An arbor press should be used to press a Woodex bearing into place. A slight chamfer is furnished on one end of the bearing as an aid in starting the fit into the housing. The inside of the housing also should be slightly rounded or relieved to make sure there is no burr on the edge of the housing to cut the bearing as it is pressed into place. We will be pleased to answer any questions and consult on any application. If we cannot help you, we will direct you to someone who can.